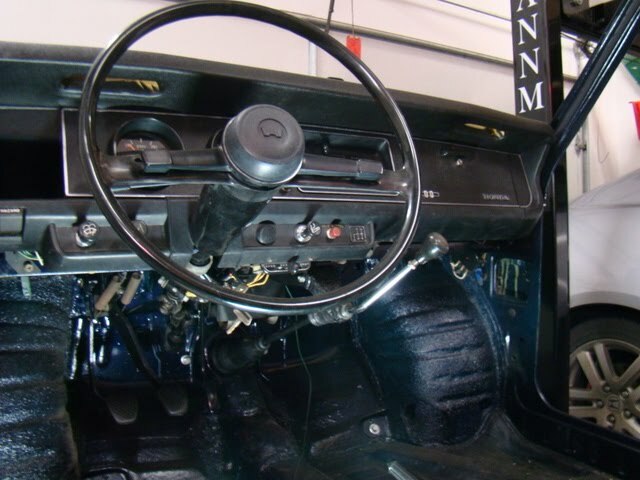 I spent the weekend getting the steering column and the shifter back together and reinstalled. I got a little nervous when the key wouldn't turn in the lock cylinder when I got everything back together. I disassembled the other car's steering column to look for clues. It turns out there's a pindle that protrudes from the lock cylinder into the steering shaft to act as the locking column. I must've gotten some grit in this mechanism during media blasting (even though I had taped it off to prevent just this sort of thing). This pindle needs to move freely to allow the lock cylinder to turn. Once I pressed it into the lock housing, the cylinder turned freely. Of course, I won't have a locking column unless it eventually pops back out. Oh well, the locking column never was much of a theft-deterrent. 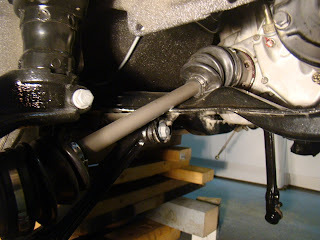 I heaved a sigh of relief when I was able to get the two 39 year old natural rubber boots to stretch back over the shifter linkage without tearing. I also got to try my hand at wrinkle paint on the shifter bracket. I was skeptical at first, since it goes on heavy and very glossy. But, to my pleasant surprise, when I checked it this morning, it was exactly the finish I'd hoped for. I did learn that wrinkle paint takes at least 24 hours to harden, as some spots got damaged on reassembly. So now the dash is looking even better with the steering column and wheel, the gear-shift and the pedals all in place. Sadly, they are all only temporarily installed. The dash is resting right against the body at the windshield bed. 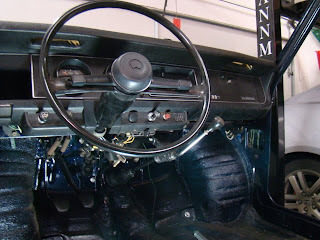 We are most likely going to have to install the windshield, and its corresponding rubber gasket, before the dash, steering column and shifter can be tightened into permanent position. Since this is the first car I have ever restored, naturally a few things have come as a surprise. I knew going into this that finding parts would be a challenge. 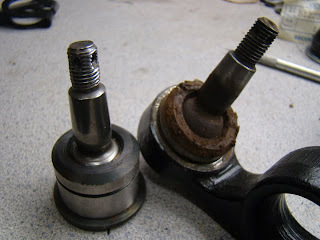 What surprised me was how easy and readily available parts are...if you are restoring a domestic car. My uncle sent me a copy of Hemmings Motor News' Collector Car Restoration Guide. The magazine is literally riddled with ads for parts and services for the (domestic) car restoration enthusiast. Turns out, if you wanted to build a '58 Chevy pickup from reproduction parts all you need is a credit card and a place to do it. I was lucky en ough to procure what may be the last two new old stock (n.o.s.) lower ball joints known to man. Mike O'Connor put me onto the CMS (Consolidated Motor Sports) website. This is essentially a clearing house for unsold motorcycle parts in The Netherlands. Is sounds like they've had these ball joints sitting on their shelf since around the time I was born. It only took five days, well five days and $300, and they arrived at my doorstep. As you can see, the original joints are in pretty sad shape. I also scored a pretty good deal on a reproduction exhaust pipe that a guy in Missouri sold me on eBay. He's been parting out a few N600s, and while most if his stuff is used, this piece was made from new material to match an original. I got notification Saturday that the bushings for the sway bar have shipped, so the front end can go together when I get the CV axles come back from the shop. This is all contingent on what happens with the sub-frame. The rust issue is forcing me to replace it, or cut out the bad spot and weld in a patch. I think it's a lost cause since it's rusting from the inside out, as a result of having spent time in the Florida Keys. Hopefully, I won't have to go to The Netherlands to find another one. Completely defying my expectations for this weekend, we actually started the engine. This had been my hope for the past few weeks, but as time ran short, I had accepted the reality that turning this thing over was probably not going to happen. Well, I had my dad work on rebuilding the carb while I started getting the front end put together. Luckily, the old man was "The Carb Guy" at his auto shop before he retired, and he made short order of the little beast. We did run into what has the potential to be a major problem. For some reason, the drive axles are hitting the sub-frame. Normally this wouldn't be too big an issue, since they should straighten out once the car is sitting on its tires. 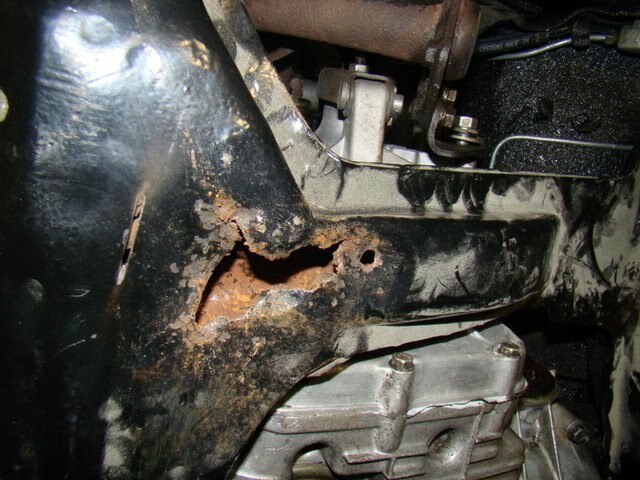 The problem is, when we used a floor jack to compress the struts, the CV boot was still in such solid contact with the frame, that it would have destroyed itself had it turned under power. So far I've checked with a couple of N600 savants, and a few of the more mechanically inclined fellows I know, and we're baffled. Clearly, the car will never move unless we correct this issue, so I have to figure this one out. On the bright side, We got the dash and wiring harness installed, oh, and we STARTED THE ENGINE!